This site is dedicated to helping operations of any kind in their pursuit of being high performance. You can engineer them to happen on purpose. I operate under the assumption that your business, your people, your customers and your bottom line can’t wait for the former, and therefore I have assembled specific engineering techniques to facilitate the latter. 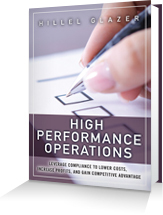 I describe how to achieve high performance operations in my book by the same name. But, this site is not about selling books, it’s about creating high performance operations. I believe, because I’ve done it and seen it done by others, that high performance operations only emerge from businesses that not only have all the right pieces in place, but that know what the right pieces are and how to put them together. Too often, the “right pieces” start and end with the right people. But that’s only the start. High performance operations understand and deal with what’s going on inside their business in ways that their competitors don’t. They deal with external factors such as compliance in ways that their competitors won’t; and they achieve results their competitors can’t. My colleagues and I help you make this happen.